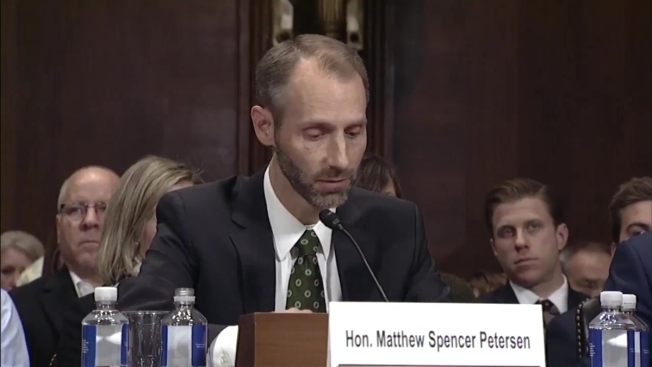 Millions have now watched video of Matthew Spencer Petersen struggling with questions Thursday from Sen. John Kennedy, a Louisiana Republican. Petersen, who serves on the Federal Election Commission, had difficulty answering questions about the "Daubert standard," which has to do with expert witness testimony, and the definition of a "motion in limine," which has to do with the introduction of evidence. He acknowledged he has never tried a case or argued a motion in court. He said he last read the federal rules of evidence in law school. Democratic Sen. Sheldon Whitehouse of Rhode Island posted video of the exchange on his Twitter account, labeling it "MUST WATCH." Whitehouse wrote: "Republican @SenJohnKennedy asks one of @realDonaldTrump's US District Judge nominees basic questions of law & he can't answer a single one. Hoo-boy."